Resin is a strong, high-quality plastic material used mainly for seat, back and arm-rest elements as well as tabletops. 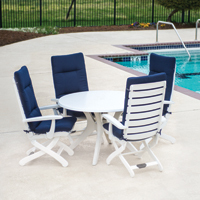 Resin deck furniture is extremely weatherproof as they do not rust or rot making it the perfect pool furniture. The plastic patio sets are also easy to clean. KETTLER's proprietary KETTALUX tabletop is produced by a two-component process. The outer layer consists of high-density resin which forms a hard outer shell. The interior is constructed of an expanded resin. The KETTALUX tabletops are 100% recyclable. KETTLER resin patio tables and serving carts give you an attractive yet sturdy place to entertain guests and enjoy meals outdoors while being eco-friendly with recyclable materials. 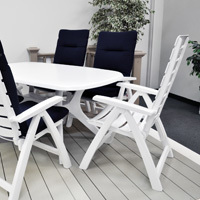 Our plastic patio sets can be left outdoors in all types of weather and is Made in Germany. 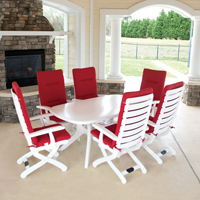 We also feature patio cushions for our KETTLER plastic patio sets. 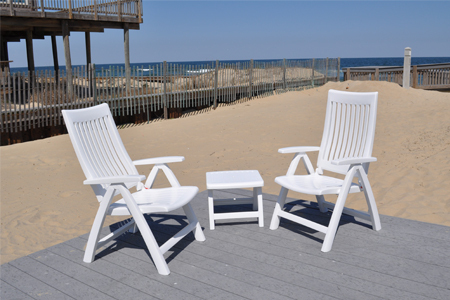 Add some splash to our resin deck furniture by adding patio cushions for added elegance and comfort.